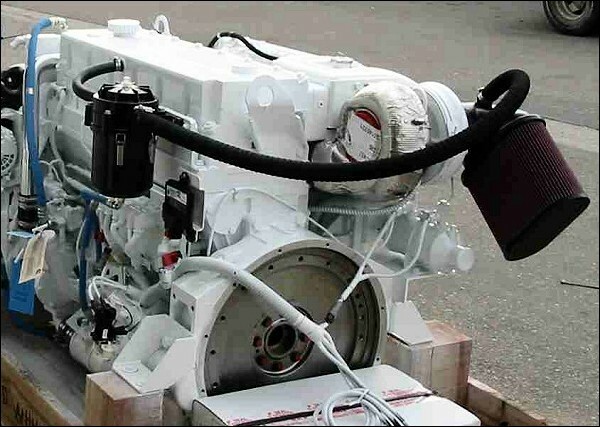 For the past 15 years I’ve been thinking about (and trying to understand) the crankcase breathing system on the Cummins B Series engine in typical marine applications. I wanted to develop a simple and cost effective CCV system for this much desired engine. This period of “contemplation” goes back years ago and sprang to life during a plane ride with my Cummins distributor/sales rep, Mike Hoffman. It was the only time I ever flew in “First Class” and after a few bottles of red wine, we coined a name: “ENVIROVENT.” Now I feel that I have something to offer; a simple and effective CCV system that will make most everyone happy. But first I’d like to give some history and some basics for understanding the crankcase venting system that is used on this particular engine, along with the ABC’s of what a CCV (CLOSED CRANKCASE VENTILATION) system is supposed to accomplish. 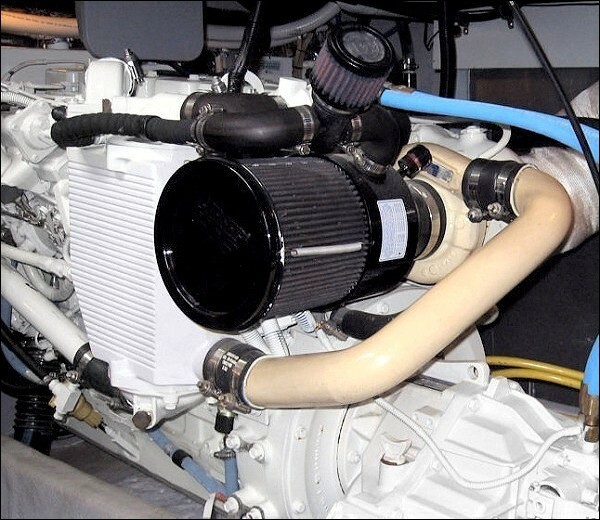 Since first introduced to marine service in 1985, the Cummins 5.9 liter “B Series” has become the most popular, well respected, and most sought after marine diesel in this size range ever produced, and this status is well deserved. Around late 1988 or early 1989, the engineers at Cummins released the 6BTA 300 B version (CL 970) and along with this new high performance rating, they also introduced a low profile, flat cast aluminum oil pan. Somehow, during the design of the new oil pan, the design team assigned to this new oil pan project missed a very important engineering design feature that should be part of any oil pan design… The pan was so shallow (about 9″ lower than the center of the crankshaft), that under normal operating conditions the connecting rods would “dip” the oil. As time passed, and the RPM range of the B grew (3000+ with the 1997 release of the 370 Diamond) the rod “dipping” now became more like rod oil whipping. Instead of deepening the pan an inch or two, the engineers designed a new baffle system to help contain / control oil sloshing in the oil pan… This seemed to mitigate the issue, but I still recommend keeping the oil pan level towards the low end of the recommended oil capacity. 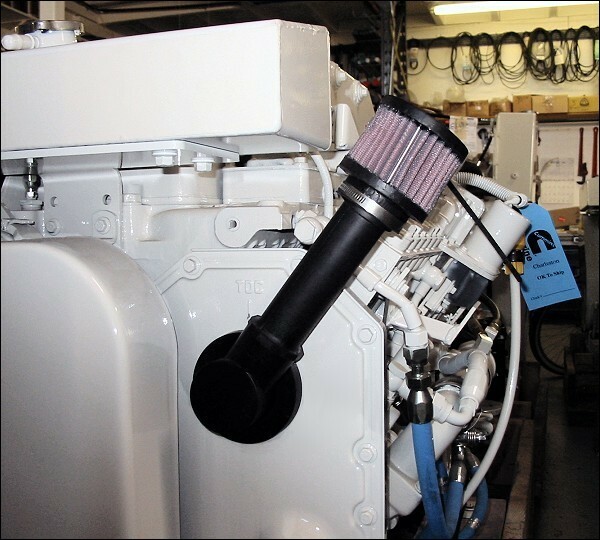 For all inline or conventional drive-trains with the engine facing the bow of the vessel, the Cummins B series engines like to breathe from the front timing cover. Reason?–It is because it’s a very “calm place” inside the engine and the timing case, due to its base design, has a tendency to condense much of the oil vapor and return it to the pan (due to that slight cooling effect and large surface area of the steel cover). With this knowledge we went about designing a simple and effective way to allow the engine to breathe from this area. We adapted some already made Cummins’ parts to allow the installation of a special S&B crankcase type air filter (known as a PCV vent filter in the automobile industry). Our first and still used design was really simple. We capped off the rear side vent tube, installed this front timing case vent and now had a super simple solution to the problem of a “dripping vent tube”. Too simple but very effective. As an added plus for this system, simple oil filling from this location is now easy when overhead clearance is minimum. A good CCV will limit the amount of vacuum on the system and / or be adjustable for individual applications. This is an important design function of any CCV unit and can be accomplished in many fashions. We prefer a much simpler approach than most other manufacturers of CCV units. Since our unit is “engine specific” as to sizing, the unit and connection assemblies limit the vacuum by design and actual size, and do not rely on an expensive “vacuum regulator” with springs and diaphragms that is far from “maintenance free”. And lastly, a good CCV should be relatively inexpensive to upgrade from your existing “open breather”.Our new “Envirovent” system meets what we think are the features that make a good system, plus the system is designed specifically to the “B” series mechanical engines (Cummins 4BT thru the most popular 6BTA Diamonds). 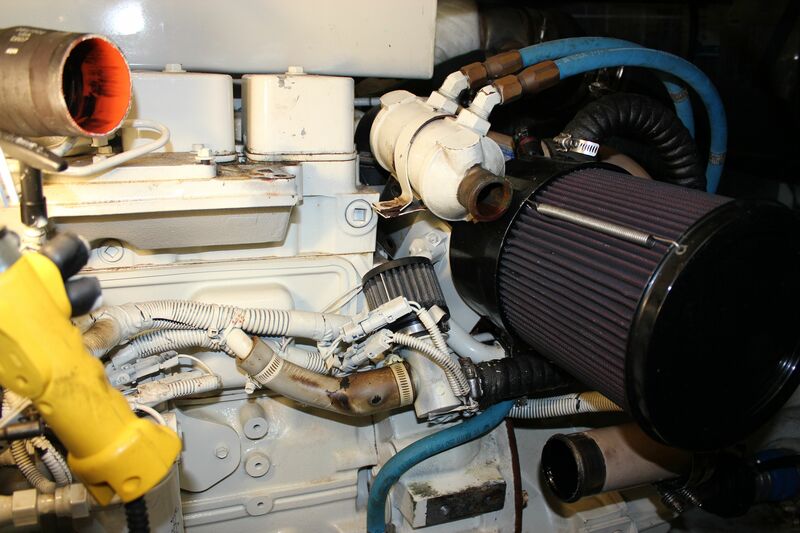 Although the general design principles we have used to develop the system and share with the general public could be applied to many other engines (we do on a limited basis), we are just a small company and only focus on the engines that we deal with on a day to day basis. As a reader of this article explaining our design ideas and “politics”, we welcome you to glean our knowledge and expand on it to fit your own needs. 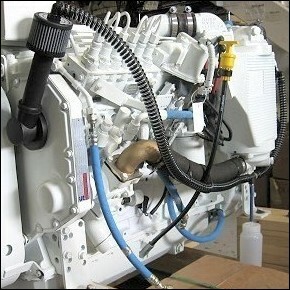 The “Envirovent” CCV system specifically designed for the unique crankcase ventilation requirements of the Cummins “B Series” marine engines.